Veggies Rule: LSA - What's With That? LSA - What's With That? 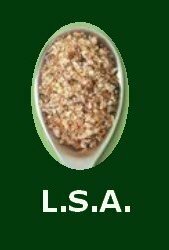 I get a lot of flack being a vegetarian, however, there's one thing that can be used by both veggies and meat eaters and that's LSA. What is LSA? I hear you ask (well, I don't literally "hear" you of course that's a figure of speech). If you know what LSA is - then you don't need to read any further - you can wait for the next blog report. If you don't then swing over to my website and read What is LSA? It's not a long article, but will give you the answers. In the meantime let me say that for meat eaters with high cholesterol - it's going to help. By the by did you know that most vegetarians don't have high cholesterol unless they eat copious cheese!, and I don't know any vegans at all with it - what does that tell you about animal products???? I'll leave you today on that thought - here's the link again: What is LSA? A Vegetarian in the Family. OMG! I Didn't Know That. Hot Chocolate - Be Still My Beating Heart!